There has been a library at Queen’s ever since its foundation in 1341 by Robert Eglesfield, Chaplain to Queen Philippa, consort of Edward III. The Upper Library was built between 1692 and 1695 to house large donations from Thomas Barlow, one-time Provost of the College and later Bishop of Lincoln, and from Sir Joseph Williamson. The designer is not known, the most likely candidate being Henry Aldrich, Dean of Christ Church, who designed other buildings in Oxford and stylistic similarities suggest that he might have been the designer of Queen’s Library. However, Timothy Halton, Provost of the College at the time the library was built, is also a possible candidate. He was an accomplished man capable of designing such a building but no documentary evidence exists for either man as architect. The builder was John Townsend and the plasterwork, which is the most outstanding feature, was modelled by James Hands. The stucco frieze is the work of John Vanderstein who also created the sculputures on the garden facade. The beautiful woodcarving is attributed to Thomas Minn and son. The Queen’s College collection is set apart from all other Oxford college libraries thanks to a donation of £30,000 in 1841 by Robert Mason, an Old Member, who stipulated in his will that the money had to be spent solely on the Library within three years. In order to accommodate the large number of volumes purchased with Mason’s bequest, the open arcade below the Upper Library was enclosed (following the designs of Charles Robert Cockerell, professor of architecture at the Royal Academy) to form what is now the Main Library. The Librarian of the time showed exceptional foresight: he not only purchased a great number of modern books, but also a wide selection of the greatest editions of printed books from the fifteenth to the nineteenth century. By the late 1840s Queen’s had what was probably the richest college library collection in the country. During the early twentieth century the library spread from the existing buildings to vaults beneath the back quadrangle. The environmental conditions in these vaults have been deemed unsuitable for the storage of a collection of such historical importance. There is also a need to modernise facilities for the undergraduate collection. Consequently, the College is actively considering how to improve and enhance its library facilities. Between June 2013 and January 2014 the Lower and Upper Libraries were both refurbished. The Queen’s College Library is widely regarded as one of the most beautiful Baroque buildings in Oxford. It also remains a thriving centre of College academic life and is exceptional in retaining the seventeenth-century Upper Library as a reading room for students. Refurbishment was crucial both for maintaining such historic grandeur and for enhancing the high quality of its reader services. Originally a part of the planned Library extension, the refurbishment went ahead as a standalone project between June 2013 and January 2014. The project has succeeded in enhancing the Library’s intrinsic character while making it a cleaner, brighter and more inviting environment in which to study. For 12 months the Library exterior was clad in scaffolding to enable a complete re-roofing as well as repairs to the stonework. Restoration work was carried out on the two Queen’s stone eagles, tympanum and swags (on the eastern façade) by Cliveden Conservation. The repair process is intricate: small repairs can be made in-situ but significantly damaged stonework requires clay models and silicone moulds to guide the workshop stone carving process. After the repairs are put in place they are given several coats of copperas (ferrous sulphate) to help them blend in with the surrounding stone. 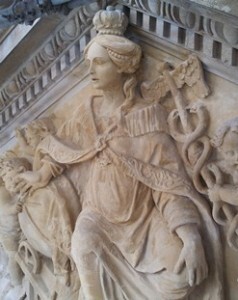 Among the most elaborate of repairs was the replacement of Wisdom’s head (the figure in the centre of the tympanum). The crux of the interior refurbishment lay in the restoration of the Upper Library. Before any renovation could begin, specialists movers Crown Fine Art had to carefully pack and move into storage the manuscripts, globes, orrery and the statue of Queen Philippa. The famous ceiling plasterwork was painstakingly cleaned (using just fine paintbrushes and de-ionised water) while the flat surfaces were repainted to match the original paint scrapes. For this to happen, a birdcage scaffold was installed in the Upper Library allowing unparalleled close-up views of the plasterwork. The inside windows were refurbished and layers of UV film were removed from the individual panes. These were installed just before the millennium to protect the Upper Library books from light damage but their efficiency had decreased over time. Following contemporary conservation advice, special transparent UV blinds were commissioned to hang over the windows panes instead of adhere film to them. Layers of grime, dirt and lacquer were meticulously removed from the floor using sharp knives to scrape away at the surface. The result has revealed the original grain and colour of the wood. The master carpenter of the project also worked on the wooden bookshelves to re-carve some of the missing detail. As well as restoring the Library to its original glory, work was done to bring the building into the twenty-first century. Installation of new lighting, heating and ventilation systems ensures a comfortable working environment. After some complex internal modelling it was decided to replace the old radiator system with under-floor fan coil units capable of both heating and cooling the Library. Interestingly, this system models the form of fresh air ventilation from floor vents that existed in the Upper Library prior to the construction of the Lower Library in the 1840s. The greatest transformation to the Lower Library resulted from the cleaning and waxing of its wooden surfaces, which included bookcases, floors and panelling. In conjunction with the repainted ceiling, LED bookcase downlighters and a new carpet the space has become noticeably lighter and brighter. Some of the bookshelves were originally covered in leather which, over the decades, had started to perish. A team of conservators working for Cliveden removed any unsalvageable leather but retained and restored any still in good condition as a historical record. The Lower Library was given a modern makeover in terms of its furnishings. A local Oxford joinery was contracted to refurbish the existing tables and assemble new, more comfortable chairs – as directed by student opinion. In compliance with DDA (Disability Discrimination Act) legislation, and to ensure the Library is accessible to all, a special adjustable desk was also created. Finally, the latest in library security equipment has been installed. By using RFID (Radio-Frequency identification) technology, Library staff can more easily track the circulation of books and can carry out annual stock checks more efficiently. Students have benefitted from having a new self-issue machine which permits them to borrow books twenty-four hours a day.